In prison you spend the majority of your time in an 8'x10' cell. At work you spend most of your time in a 6'x8' cubicle. In prison you get three meals a day. At work you only get a break for one meal and you have to pay for it. In prison you spend most of your life looking through the bars from the inside wanting to get out. At work you spend your time wanting to get out and inside bars. In prison there are wardens who are often sadistic. At work there are managers. In prison you can breastfeed. At work you can't. In prison you get underfloor heating. At work you get legionnaires disease from the crappy air conditioning system. In prison the gym is free. At work you have to pay a membership fee. In prison a positive drug test means a longer sentence. At work a positive drug test means you are out on your ear. In prison you can smoke. At work it is prohibited. John Tamihere wants benefits paid to the National Maori Urban Authority so they can control how the final recipients spend them. It's not a new idea. It has advantages and disadvantages. In a way such a system resembles what happens in the US where the federal government provides funding to the states which then control the delivery. The states break it down further to counties. The smaller the unit the greater the intimacy between the provider and the recipient. Certainly more pressure can be brought to bear and more specialised and relevant support can be offered. I am also reminded of Switzerland where local government has retained control of welfare and there were over 3,000 different systems for seven million people (figures from the late nineties). But federalisation applies to all - not just one group of people. What Tamihere is proposing means treating Maori differently which would face enormous political barriers. The risk of corruption and nepotism is very real, especially amongst people with tribal mentalities. The power concentrated in the hands of a few seems undesirable and a backward step for Maori. On the plus side there would have to be compulsion involved which might not be a bad thing. If people didn't want to come under the control of the authority, didn't want to losing their spending autonomy, their best option would be to get job. That happened in the US when activity obligations were introduced. Many people made their own arrangements. Decentralisation properly managed could be an improvement but would have to operate on an all or nothing basis. The various responses to this idea are probably more interesting than the idea itself. Typically the Greens are prattling about "beneficiary rights"
Metiria Turei says,"We completely oppose attempts to impose centralised control over people's lives. They [the authority] have no right to decide for people how their income is spent. I find it offensive that Maori are proposing such a policy." Alan Duff says,"The only way is to stop giving benefits entirely, and families will get by exactly the same as families do anywhere else on the planet where there are no benefits." 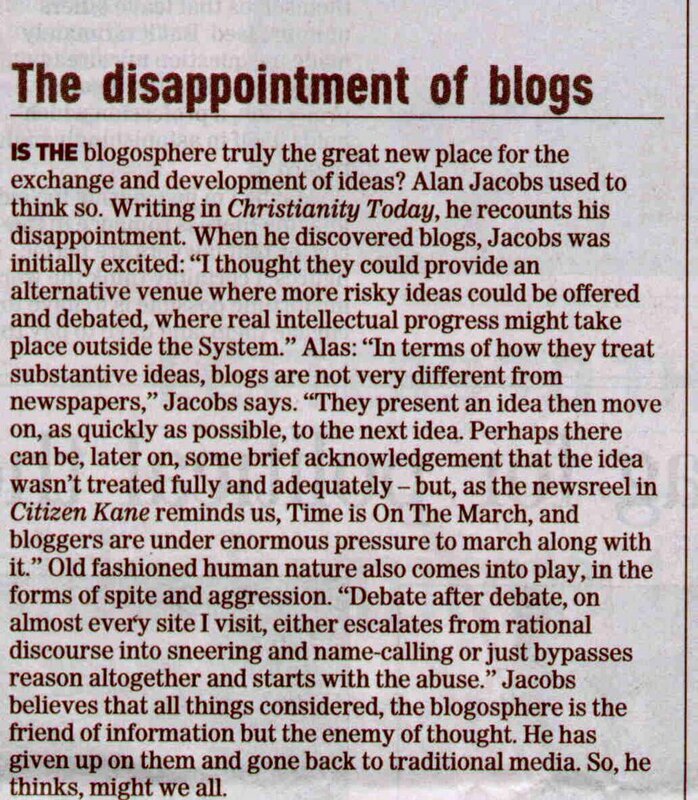 Here is a letter from the DomPost this week. Speaks for itself. SuperTrev - the "shameless self-promoter"
Is it any wonder people are reluctant to do jury service when you read a story like this. Is it standard practice for a district court to mail the names of jurors to the defendant? It looks like the only mistake the court made was to omit a covering letter which I am assuming tells the recipient that the information is confidential. - historical racism from journalists and politicians who casually referred to Maori as "niggers"
- theft of land last century, specifically that belonging to the Kahui's great-great-great-grandparents. And finishes, Or would he whisper, softly:"Judge not, that ye not be judged." Ten years after Bill Clinton introduced real welfare reform in the US they are renewing funding rules. Based on the 2005 caseloads federal funding to states now requires 50 percent of welfare recipients to be engaged in 30 hours of meaningful activity - playing the pokies or getting pissed doesn't qualify. This comes after the sixty percent reduction in welfare rolls already achieved. Liberals are naturally critical. Conservatives, however, say the new rules will push welfare recipients into private jobs. “What we learned the first time is that poor people are a lot more resilient and capable than the left presumes,” says Jason Turner, a Heritage Foundation visiting fellow who consults on welfare with about 25 states. Gremlin At RNZ - Broadcasts by Radio New Zealand have been hit by major technical gremlins this afternoon, seriously affecting news feeds and audio services. I read it as Kremlin at RNZ. Under Welfare to Work - which takes effect from Saturday - those applying for the disability support pension or parenting payment will be forced onto the lower Newstart allowance if they are assessed as able to work 15 hours a week. Those breaching certain rules - missing an interview, for example - three times in a year could lose payments for two months. Sue Bradford's bill to allow women to keep their child in prison up until the age of two was sent unanimously to select committee last night. I support this move only because prison would appear to be the safer option for these children. Given the social environments their mothers come out of there is often nobody better to care for them. BUT each situation should still be treated on a case by case basis. If there was a willing and stable alternative caregiver eg a grandparent, that person should be preferred. The child's interests should take precedence over the mothers. It isn't easy getting into prison. In most cases the mother will have already been given and failed to take second, third etc chances. But many questions remain. What about a mother with an existing baby at the time of incarceration. A one year-old perhaps. Will that child be housed in prison or does the bill only apply to newborns? If the woman is in for a very long sentence wouldn't it be better for the baby to be bonding with someone else? What about the father? Where are his rights in the hierarchal order? If he is a perfectly good father (not highly likely) does her right to breastfeed take precedence over his desire for custody? It'll be an interesting debate. 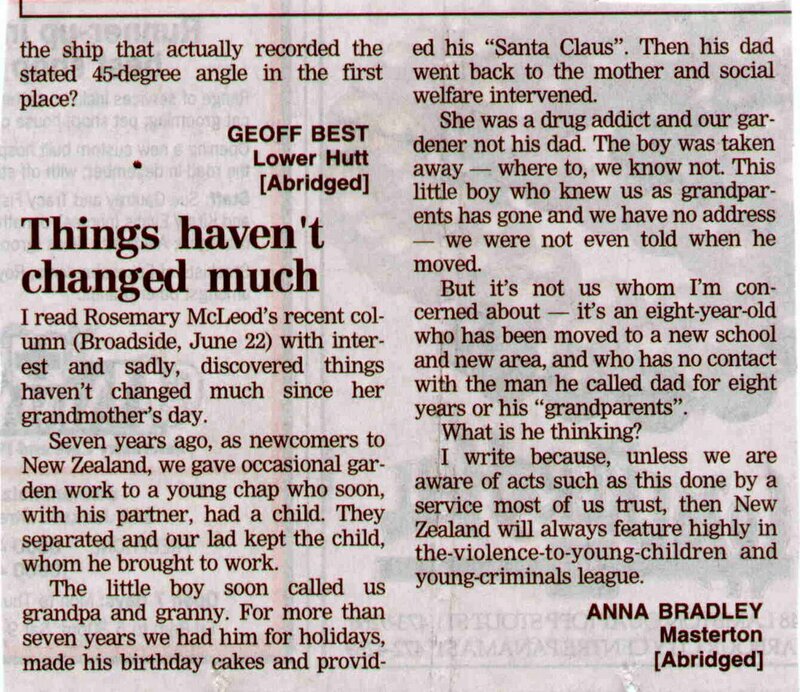 Here is an interesting report about the mother of Lillybing, given such a sympathetic write-up in today's DomPost. When Lillybing was killed Terina Matiaha was 22 and she already had three children - not two. According to ex Progressive MP, Matt Robson, National is headed for its 4th consecutive election defeat in October 2008. It hasn't managed to be that incompetent since 1946. National isn't up to leading New Zealand. Not only does he know that National are going to lose - he knows which month the election is going to be held in. I didn't know this, from Wikipedia, Despite having achieved high political office in New Zealand, Robson did not become a naturalised citizen until 2000. Under the terms of New Zealand's Electoral Act, anyone permanently resident before August 1975 has the right to vote and stand for election. I thought that a candidate had to be a NZ Citizen to stand for Parliament. Did the Electoral Act change or am I wrong? The paper came late this morning and I have only just seen the cover story about Lillibing's mother. Here is another sadly pathetic young mother who keeps getting pregnant when she can't cope. The journalist says Matiaha played no part in her daughter Lillybing's death in 2000. I think in a passive way she did. She neglected her. She constantly left the child in the care of her Aunts without supplying nappies or food or clothing. Her crime was one of ommission. When Lillybing died Matiaha was in hospital with another younger baby ill with dehydration. I wonder what happened to that little girl? Now we learn she had twins in February this year. Born prematurely one has suffered continuing illness and the other died this month. Cot death is suspected. Although the mother lives in Wellington the death happened in the Wairarapa. The child arrived dead at Masterton hospital. That is the second Matiaha baby that has arrived dead at Masterton Hospital. I feel for the staff. The other twin has now been taken into state care. Tariana says, Over this last week the nation has been grasping for understanding to explain away the tragic deaths of three month old twin boys in Mangere. The blame merchants have been at it again, trotting out the same line, finger pointing, grabbing headlines - but no solutions. It's true. I blame the individuals who have lost their humanity thanks to government's condoning their rotten lifestyles by paying them to perpetuate the manginess. But I do have a solution. STOP DOING IT. Stop paying people to churn out babies and they will stop. Those babies weren't wanted. They were in the way. If they were wanted they wouldn't be dead. Hell, if we are going to finance people's destructive drink and drug habits, let's pay them NOT to have babies. Even that would be an improvement. Yesterday the NZ Herald had a go at estimating the benefits going into the Kahui/King families and put it at between $845 and $1,395. That seemed conservative to me. Rodney Hide came up with a higher figure and asked Minister for Social Development David Benson-Pope whether he agreed. Did productive tax-payers pay for the tangi as well? This grant may be available to the partner, child, parent or guardian of someone who has died, to help towards the cost of the funeral. The grant of $1662.58 (as at 1 April 2006) is income and asset tested. I prefaced tax-payers with productive because yesterday family 'spokesperson', Ani Hawke told Paul Holmes that she objected to these people being called bludgers. They pay tax, she said. That was after she had said to Holmes, "Don't sneer at me Paul. I thought you had more class than that mate." She had rung him by the way. 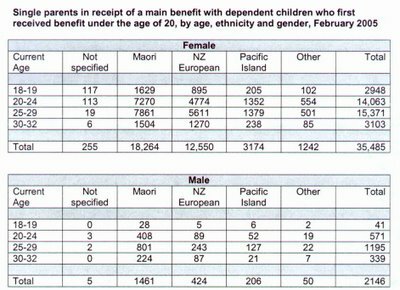 The majority of single parents who have been on a benefit since their teens are Maori. 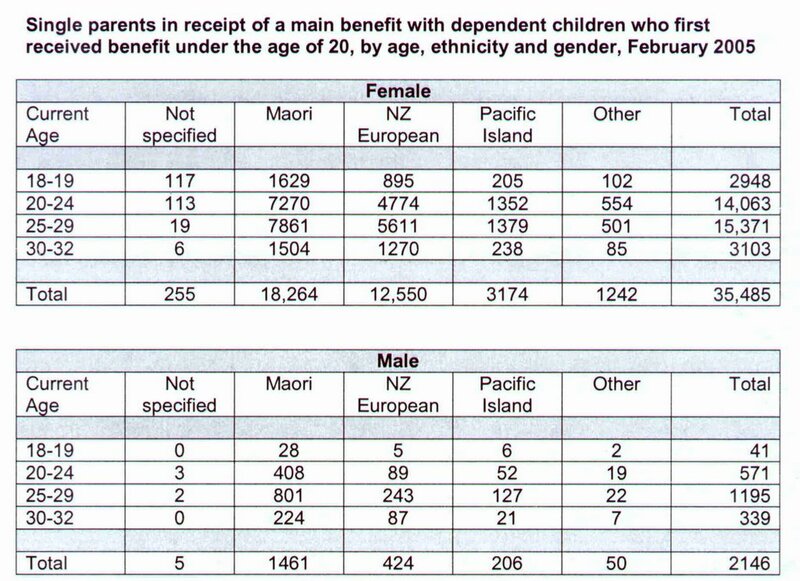 In 2005 almost 20,000 benefit-dependent Maori single parents had first received a benefit under the age of twenty. In the care of these parents are around 33,500 children. The equivalent figures for NZ European are just under 13,000 parents looking after approximately 19,000 children. The availability of the Domestic Purpose's Benefit to 18 and 19 year-olds, and before that, the Emergency Maintenance Allowance to 16 and 17 year- olds, serves as a bigger trap for Maori than other group. Many go down this road because that's all they have ever seen. Often they are too young and immature to cope with the responsibility of parenting, sometimes with tragic consequences. What these kids need is more time to grow up free from the temptation of the seemingly easy money that comes with babies. Parenting is never easy but teenagers are prone to finding this out too late. The government must end this neglectful policy and give young New Zealanders, Maori in particular, a chance to lead lives that aren't prematurely burdened with unwanted responsibility. Note. The table only features up to 32 year-olds. This is because the MSD doesn't have the electronic data going back further. So these figures are minimum. According to the DomPost, More than 1000 Maori children were victims of abuse in the past year, a rate far higher than other ethnic groups, Child Youth and Family Services figures show. It dealt with 1010 cases of physical abuse involving Maori children for 2005, compared with 613 Pakeha cases and 451 Pacific Island cases. Yet the following table shows more than 13,000 cases of established abuse. If both pieces of information are correct the difference must be accounted for with mental abuse, sexual abuse or neglect. Notice the Pacific Island rate of physical abuse is also very high at 22 percent of the total reported. Pacific people make up around 7 percent of New Zealand's population, although that would rise in the lower age groups. One more thought. There may be some over-reporting with some children recorded in more than one ethnic group. Typically the difference would not be highly significant. Nga Puhi leader David Rankin has called for gang members not to take the law into their own hands over the recent deaths of the three-month-old twins in South Auckland. Mr Rankin has been approached by two gang representatives who have stated their wish to pursue muru (Maori justice) against those present when the twins were fatally injured. ‘I have urged them to allow the Pakeha justice system to take its course’, says Mr. Rankin, ‘but every day that passes, the desire for utu (revenge) is intensifying. I believe it is just a matter of time before gang retribution takes place’, he says. Mr. Rankin wishes to urge the family at the centre of the investigations to cooperate fully with the Police for fear that if they do not, Maori forms of justice might start to appear. Deborah Coddington, Wellington host for NewstalkZB this week, interviewed Police Association head, Greg O'Connor about the Kahui business. He was unsurprised at the "circling the wagons" tactic. The police see this all the time with Black Power and Mongrel Mob. Obviously the practice has filtered down. What he suggests could be going on is the family are sorting out who will take the rap. Getting the facts of the matter will be incredibly difficult. Businesses are receiving up to $17,000 from taxpayers for each beneficiary they employ, but Work and Income cannot say how many are kept on after the 12-month subsidy ends. The Job Plus scheme has subsidised the wages of 123,000 beneficiaries working as labourers, restaurant staff, builders, salespeople and machinery operators since it began in 1998. The scheme provides up to $214 a week for every participant. I can't work out how $214 x 52 becomes $17,000 but anyway....is there any check on whether the subsidised employers keep the ex-beneficiary after the year-long subsidy ends? According to Ray Smith, deputy CE of the Ministry of Social Development, "Our overall measure isn't whether the employers hang on to the individual, it's whether or not they come back on to a benefit". If it became apparent that an employer was regularly accessing Job Plus and not providing work after the subsidy ended then Work and Income "would stop working with them". Stop working with them. That's reassuring. The civil service seem obsessed with such concepts, to the point where they will pay $121,000 for a "gender-neutral job evaluation tool". According to Stuff, The work being done was designed to ensure the evaluation was not gender-biased. Not that I want any more tax-payer money thrown down the drain but the Ministry of Social Development could do with a "gender-neutral employment evaluation tool". 6324 (2006). 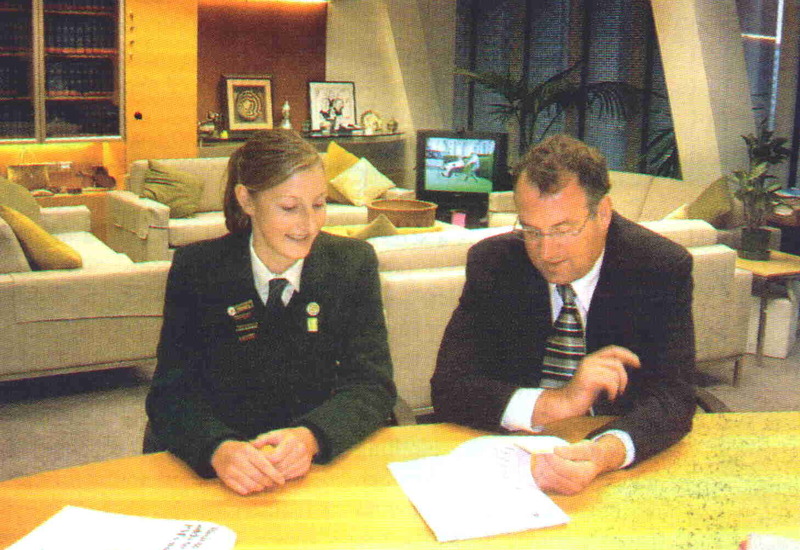 Katherine Rich to the Minister for Social Development and Employment (31 May 2006): How many policy analysts does the Ministry employ broken down by gender? Hon David Benson-Pope (Minister for Social Development and Employment) replied: As at the end of April 2006, the Ministry of Social Development employed 154 policy analysts of whom 103 were female and 51 male. Then again, as long as the bias is running in the "right" direction, it's probably okay. You can breathe a sigh of relief. Please read the link in the following post and then come back to this. The Maori Party believes inadequate resources are partly to blame for the country's appalling child abuse record. Party co-leader Tariana Turia says the case of the Kahui twins highlights a group of people who have become marginalised. Mrs Turia says she has shed many tears over the deaths of three-month-olds Cru and Chris Kahui, a week ago today. She says the case points up the need for better understanding of families under pressure. Tariana Turia says privacy laws are also a problem, because government agencies are often afraid to share information about families in trouble. Alan Duff has a different viewpoint. He has no time for the current Maori leadership, particularly Tariana Turia. In this interview from Friday he says, "I have a theory. I believe all this excuse mongering has been going on so long we are believing it. Each bunch of do-gooders and absolvers lower the bar further." There seemed to be somthing amiss. This morning I read the mother of the Kahui twins is 27. The twins can't possibly have been her first birth, I thought. It doesn't fit with the profile. (Note. 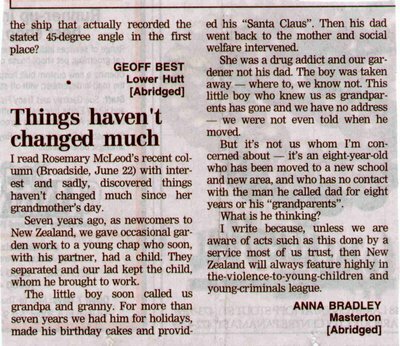 The underclass is not confined to Maori). People are sometimes tempted to believe New Zealand in the fifties and sixties was some sort of paradise, especially after a week like the last. But every period had its problems. "It would be idle to pretend that everything is perfect in New Zealand. There are some big snags unadvertised, but definitely there is in every new country. New Zealand is no exception. Tucked away at one end of the world, it undoubtedly has a small-town outlook and its Governments of whatever party tend to grind out dreary 19th centuryish radicalism. It is under-populated with 2,500,000 inhabitants. Its potential has not yet been really tapped and the country remains primarily agricultural and pastoral". Referring to the upward trend in brewery shares since the war, the correspondent says this has occurred in the face of considerable adversity, much of it artificial. The two big breweries still have to contend with a poll every three years for or against Prohibition, hamfisted hotel price control, and last year the doubling in one go of duty on beer. In spite of all this the rise in their shares has been almost sensational. "Even these performances could have been bettered were it not for a drab egalitarianism which abhors the idea of luxury hotels and so prevents New Zealand with its magnificent scenery from being properly opened as a tourist resort," the correspondent continues. "The balance of payments is a perennial worry to New Zealand. Last year things became really critical and the Government faced with the necessity of doing something desperate however unpopular, jumped up taxation in a big way, slashed import quotas and borrowed a lot of money abroad. However this year the terms of trade turned more favourable and the Government measures have been shown to be more panicky than wise. The extra taxation has proved crippling and has produced more income than was really necessary. Strict import quotas only lead to dishonesty and foreign credits were found to be larger than required." "With an election in the offing next November, the Government could not admit to having been wrong and little was done to put matters right in the last Budget, so New Zealand has now supplanted the United Kingdom in the unenviable position of being the most heavily taxed country in the Commonwealth." This is from the SST Denis Dutton's "Arts & Letters Daily". 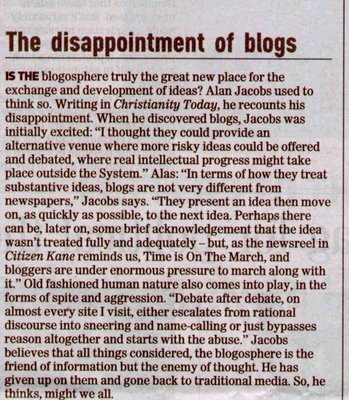 I agree about the "spite and aggression" and thankfully, and thank you to readers of this blog, we don't get much of it here. Most comments of this type are easy to ignore because they say more about the mentality of the poster than the merit of their ideas. Letters-to-the-editor aside, where there is a lack of immediacy and no guarantee of publication, newspapers aren't interactive. Just as talkback radio took off and is now a firmly established part of the media culture, blogs have a similar future. People want interaction. They want to be able to express their own view and hear others, though I suspect the first is more important. As an "alternative venue" for testing riskier ideas, blogs have no parallel.